She said that she had purchased a necklace with that quote on it a few years ago to celebrate her first year as CEO of her company. She closed her message by saying that that didn’t have anything to do with anything, but she just thought it was really neat that we had that in common. “Actually, your noticing that, and your having a necklace with that quote, has everything to do with everything. Paying attention to the things we are attracted to and the messages that appear, and noticing the ideas and people that come to us, though they seem random or coincidental, is actually the way we’re supposed to live. It’s the way we have more ease, flow, and magic in our lives. And it all started almost 8 years ago when Johnathan found me and started following my events. A year later, he brought me in to tour the company that you are now CEO of (though you were not there and we would not meet until almost 5 years later). 14 months after that, he prompted me to call Camille, founder of the Holistic Chamber of Commerce, and 2 months later I was creating the Orange County chapter. A little less than five years after that, you contacted me to reserve your space in my holistic lifestyle fair. Now, 7 months later, we are working together in different areas of our work in the world. Here is what I didn’t say to her. 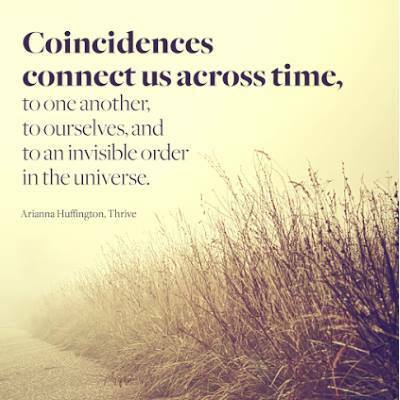 Synchronicity, Coincidence, Serendipity. All words to describe the part of reality that is invisible. We see, hear, and feel only a fraction of what is real. While we may not yet be able to witness the long winding chain of thoughts, people, and occurrences that connect with our present circumstances, they do exist. Our inability, or denial, to tune in to that which we don’t observe or understand does not negate its reality. Or its power. We receive ever present invitations to realize and participate in this powerful connection we have to our reality. By noticing the synchronicities, by paying attention to the inner nudgings, by focusing on what feels good and what ignites us — and by milking these feelings and sensations — we can step inside the flow, become conscious creators of our reality, and be one with the magic of serendipity. It all starts with observing the littlest of things, those we typically describe as random. Those occurrences we call coincidences are all connected by invisible threads in a magical tapestry, that we create, called Life.